A few days ago my friend Noreen and her dog Lola were out for a walk and surprised me with a bottle of her amazing home brewed Limoncello. Delicious straight up or on the rocks, Limoncello also brings a lovely, summery flavor to cocktails. Noreen, walk Lola over for a visit and cocktail anytime! Fill two tall glasses with ice and two Lemon Slices. Fill a cocktail shaker with ice and add Limoncello and Gin, cover and shake well. 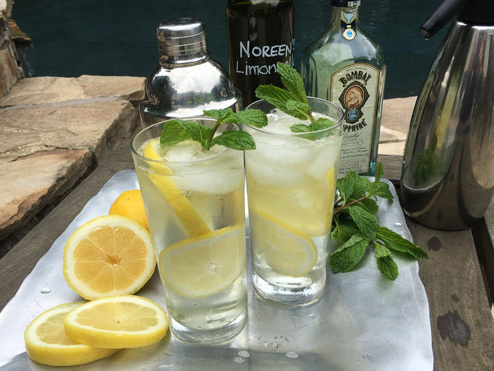 Strain as you pour the Limoncello and Gin mixture into the two glasses. Top with Seltzer, Garnish with Mint. Call a friend to come over and enjoy the other one!